Looking For Coach Hire in Cheltenham? 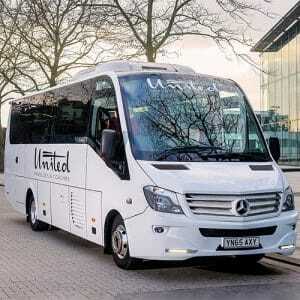 When you need to find reliable and affordable coach hire in Cheltenham, United Minibuses and Coaches should be your first port of call. We offer an outstanding level of service within the local area, so whether you’re heading to Gatwick Airport to catch your holiday flight, heading out for a night on the town with a group of friends or visiting local attractions with family, give us a call and enjoy our luxurious coach and minibus hire service. 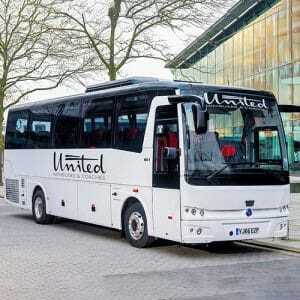 Why Choose United Minibuses and Coaches? Perhaps you’re looking for a more convenient option when travelling with a larger group of friends or family that allows you all to enjoy a stress-free journey with no need to park or drive? Or perhaps you want the freedom to go out for the night without having to worry about designated drivers? Maybe you’re jetting off on holiday and want the most relaxing start to your holiday? 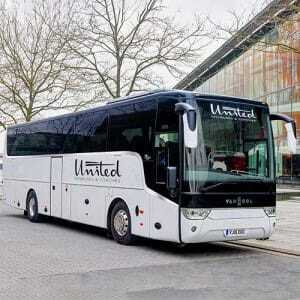 United Minibuses and Coaches are here to help in all of these situations. We operate a modern fleet of luxury vehicles which range from minibuses up to 57 seat coaches to accommodate the needs of your entire party. Our vehicles are also equipped with everything you need for your safety, comfort and entertainment. From CCTV and seatbelts to DVD/CD players, climate control and reclining seats, you’ll have a fantastic journey with us. Whether you’re journeying within the Cheltenham area or are heading further afield, United Minibuses and Coaches is proud to offer you the very best service. We offer minibuses which boast arm rests, leather seats and reading lights for optimal comfort as well as seatbelts and CCTV for your safety. Even better, we have all the most modern conveniences to make your journey even more enjoyable such as flat screen monitors, USB connectivity and refrigerators for your drinks. With a driver included within your hire cost, you’ll enjoy stress-free travel. There are lots of exciting places to visit in Cheltenham and in the surrounding area. Whether you’re visiting on holiday or whether you’re local to the area, United Minibuses and Coaches is delighted to be your first port of call for minibus or coach hire so you can enjoy your exploration of the local area. There is so much to see and do that you’re guaranteed an amazing time. Here are just some of the best things to discover in this region. Cheltenham Racecourse – any horseracing fan will know about Cheltenham Racecourse, and this is the perfect venue for a fun-filled experience. Enjoy a wager or simply soak in the atmosphere of this high-energy sporting venue. Land Rover Experience, Eastnor – a must-visit attraction for any motor head, you’ll enjoy driving off-road across 66 acres of challenging track on the Eastnor Estate. Sandford Parks Lido – cool off during the summer months with a trip to Sandford Parks Lido, one of only a handful of remaining Lidos in the UK. You’ll appreciate the original features whilst enjoying a refreshing dip. Gatwick Airport – one of the biggest airports in the UK, Gatwick is the best starting point for your journey whether you’re travelling for business or pleasure. Tewkesbury Abbey – history buffs everywhere will love visiting this ancient abbey which has cathedral-like proportions. Dating back to the Norman era, this place of worship has a fascinating history to discover. Discover Cheltenham and the surrounding area in the most convenient, stress-free way when you choose minibus and coach hire from United Minibuses and Coaches. There’s no more comfortable way to travel with your friends or family, so contact us now and find out how our coach hire in Cheltenham service can help you to enjoy your travel experience. 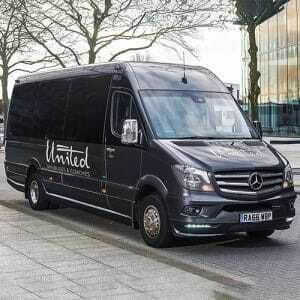 Our Range of Luxury Minibuses and Coaches. Instant free quote and booking confirmation. Minibus & Coach driver included. Live tracking on our vehicles. New and comfortable Minibuses & Coaches. Great value for money with our ‘Price Match Promise’. Luxury travel on our own vehicles. Nearly 20 years’ experience in Minibus & Coach hire. Once availability and pricing of the vehicle has been confirmed, a deposit of 50% must be paid 7 days in advance of the travel date to confirm the booking. The remainder of the balance of the booking must be paid within 2 days of the travel date. If the booking is made within 2 days of the travel date, the full amount of the booking quote must be paid to confirm the booking. To find out more about our coach hire and minibus hire services, please do not hesitate to contact us – we’d be delighted to discuss your requirements and give you a quote. 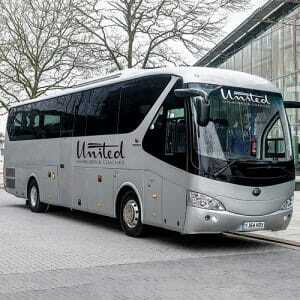 United Minibuses & Coaches carry out Minibus & Coach hire with professional drivers. Our services include Airport Transfers at London Gatwick, London Heathrow as well as all other major airports. We also provide Hotel Transfers in London, Sussex, Surrey, Kent and over the South East of England. We specialise in Day Trips, catering for all types of travellers, being individual, group or bespoke day tours. We are Professional, Reliable, Comfortable and should be your first port of call.